The 2018/19 East Sussex Football League season kicked-off on Saturday, with 56 teams set to battle it out across six divisions over the coming eight months. The stand-out result of the four Premier Division games was a tremendous 4-1 win for newly-promoted Northiam 75 at home to a Sidley United side which finished third last term. St Leonards Social and Robertsbridge United tussle for possession. Sidley, who also reached the Hastings & District FA Intermediate Cup final in 2017/18, opened the scoring through Danny Ellis, but Oscar Garcia Cruz levelled just before half time. Northiam, runners-up in Division One last season, went on to score three unanswered second half goals, Scott Embery netting two of them and Alan Johnson the other. Last season’s top flight runners-up Battle Baptists got off to a winning start with a narrow 4-3 victory at home to Sedlescombe Rangers. Dean Boyd, new signing Corey Wheeler, Glen Carrick and Adam Staplehurst scored for Battle, who recovered from 2-0 and 3-2 down to make it 3-3 at half time. Tom Cusden, Philip Hatch and Mike Booth were on target for Sedlescombe. Robertsbridge United in possession against St Leonards Social. The Premier Division’s highest scorers on the opening day were Hawkhurst United, who won 5-2 at home to 2017/18 Division One champions Bexhill AAC. AAC drew first blood through Andy Atkin, but Hawkhurst equalised shortly before the break and then took complete command with four goals in 30 second half minutes. Jake Stiles pulled one back for AAC. The other top flight game ended in a 1-1 draw between St Leonards Social and Robertsbridge United. Charlie Burns netted for a Robertsbridge side which had a player sent-off, while Grant Cornelius struck for Social. The match between Bexhill Town and Rye Town was postponed. The three Division One fixtures were all one-sided affairs. Punnetts Town matched the biggest victory of anyone on the opening day with an 8-1 win at home to Hollington United II, whose consolation was scored by Jay Tomlin. Punnetts won 17 of their 18 matches en route to the Division Three title last term and early evidence suggests they should be well capable of making the two-division step up. The same applies to Icklesham Casuals. Having finished runners-up in Division Two last season, Casuals began life in the second tier with a 7-1 success away to Mountfield United. Liam Sayer, Charlie Cornford and Harry Blunden scored two each for Icklesham, whose other goal was claimed by David Pugh. Jordan Brindley was Mountfield’s marksman. The JC Tackleway triumphed by the same margin at home to Herstmonceux. Kale Williams, Andrew Olorenshaw, Callum Fisher and James Milton were among the scorers. It was a completely different story in Division Two as four of the five games ended in draws. 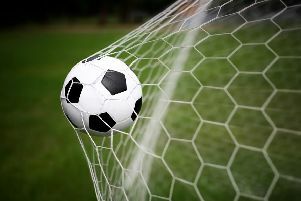 The only winners were St Leonards Social II, who prevailed 4-0 at home to a Robertsbridge United II team which is playing three levels higher than it was last term. Oscar Hammond (2), Mark Larkin and Ashley McCann got the goals. Peche Hill Select drew 3-3 at home to Wittersham. Kieran Martin struck twice and one-time Hastings United player Nathan Russell once for Peche Hill, while Ben Ward, Billy Blackford and Tom Tilbury Coombs hit the net for Wittersham. Battle Baptists II and Sedlescombe Rangers II played out a 2-2 draw. Oliver Norris and Dale Matthews’ efforts for Battle were matched by Marc Barden and Billy-Jo Driver for Sedlescombe. Two games involving sides who were playing two divisions apart last season ended 1-1. Rock-a-Nore and Catsfield shared two goals, with Reece Johnson scoring for the Rocks and Josh Paige for the Cats. It was the same score in the match between The JC Tackleway II and Little Common II. Toby Shaw’s goal for Tackleway was matched by Dominic Sinden for Common. In Division Three there were big wins for Bexhill Broncos, South Coast Athletico and Bexhill Rovers. The Broncos, who came fourth in Division Four last term, prevailed 8-1 at home to Victoria Baptists. James Downs plundered four of the goals, Matthew Stephens scored a hat-trick and Stuart Cruttenden got the other. Samuel Astle netted for Baptists. South Coast Athletico, another team to come up from Division Four, triumphed 7-0 away to Pebsham Sibex. Bradley Owens and Luke Darvill netted twice each, and there was one apiece for Connor Easton, Callum Homewood and Dom McGurk. Bexhill Rovers, relegated from Division Two, got up and running with a 6-0 win away to Magham Down. Mark Phillips and Luke Alais struck twice each, and Brad Freeman and Dan Allen completed the scoring. The division’s other two games produced high scoring draws. Orington, runners-up in Division Four last season, drew 4-4 at home to Sandhurst. James McGrath netted a hat-trick for Orington, whose other goal was scored by Scott Quested. Last term’s Division Four champions Bexhill AAC II drew 3-3 away to Hawkhurst United II. Charles Morgan (2) and Valerio Kryeziu were on the scoresheet for AAC. There were no draws at all in the five Division Four matches. Sedlescombe Rangers III, last season’s Division Five runners-up, got off to a flying start with a 6-2 win at home to Battle Baptists III, scoring four second half goals without reply. Reece Mitchell and Jake Warner netted two apiece for Sedlescombe, whose other goals were scored by Gary Underhill and Jaz Hargreaves. James Rogers bagged both Battle goals. Parkfield won 4-1 at home to Icklesham Casuals II, who are one of five teams in this season’s Division Four who were in Division Five last term. Timotey Tockas (2), Oliver Truman and Charlie Chambers scored for Parkfield, and Oliver Beaumont for Icklesham. Cranbrook Town triumphed 3-1 away to Northiam 75 II, whose goal was netted by Hayden Reed. West Hill United prevailed by the same score at home to 2017/18 Division Five champions Hampden Park. Harry Hale, Tyler Smith and Alex Southall struck for West Hill, while Jake Barker replied for Park. Joseph Parks scored the only goal as Sovereign Saints II won 1-0 away to Ticehurst. There are just seven teams in Division Five this season, but the opening three games yielded 18 goals. Having finished second-bottom last term, AFC Hollington hit the ground running this time around by winning 5-0 away to new boys Hooe. Goals from Rhys Warren (2), Steven Payne and Kelvin Lowes did the damage. A high scoring battle of the newcomers ended in a 4-3 win for Little Common III away to Hailsham-based Welcroft Park Rangers. Connor Jackson scored a hat-trick and Ryan Rankin one for Common, while Jamie Bundy (2) and Cameron Offord retaliated. Two goals apiece from Nick Kavanagh and Liam Baker fired Burwash to a 4-2 success at home to Herstmonceux II. Another full programme of league action is scheduled for this coming Saturday, including double headers at Buxton Drive, Robertsbridge Rec and Tilekiln.